Like in 2012, we distinguish between matching systems that have participated in the ontology matching tracks and matching systems that have participated in the instance matching track. There were 8 ontology matching tracks: benchmark, anatomy, conference, multifarm, library, interactive matching evaluation (interactive), large Biomedical Ontologies (largebio), plus the instance Matching (im) and ontology alignment for query answering track (oa4qa). This year, only the query answering track is not run under SEALS, all the other are. 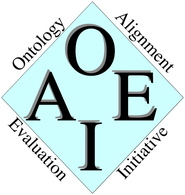 Overall, OAEI 2014 has 14 participants (this is in retreat with respect to OAEI 2013 which had 23 participants). Six of the systems participating in OAEI 2014 had participated in 2013 (AML, LogMap, LogMapLite, MaasMatch, XMap, RiMOM).